This entry was posted on September 12, 2017 at 5:02 pm and is filed under Health Care, Uncategorized. You can subscribe via RSS 2.0 feed to this post's comments. There’s nothing wrong with the approach in principle, but it creates an awful lot of different classes of insured people. Let’s suppose we allow a subsidized Medicare buy in at 55. You would imagine that this would link everyone over 55 in solidarity to preserve and extend Medicare, but it would be just as likely as we find over 65 Medicare people resenting the new 55-65 group. After all, this group has BUY Medicare. They haven’t really earned it the way true over 65 Medicare people have. Resentment is a powerful force, especially since people tend to resent people who have less than they have rather those who have more. BTW That Munch picture, The SIck Child, was on the cover a pretty good book about tuberculosis, The White Death. Our car got a flat in Rochester, MN, so we spent a night in town and went to the Barnes & Noble in the downtown maze after dinner. It’s a company town, so they had a great medical book collection, so I wound up learning something of the history of tuberculosis. 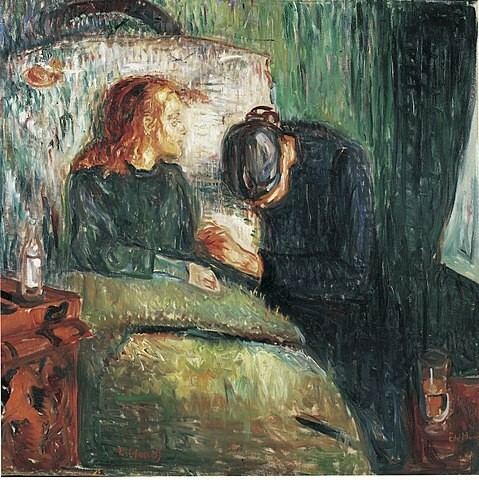 Munch’s older sister died of the disease, and you can tell from the painting that he was very much affected by this. Another stage would be to provide lifetime medical care for veterans (not just for service-related ailments), which should be politically viable and allow people in all economic classes to get healthcare.